The world of the psion is a strange and wondrous place. 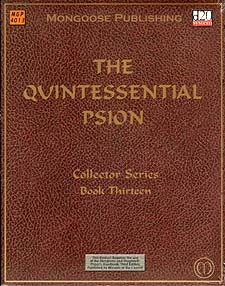 Where others see magic or spirits, the psion is aware of the flows of thoughts and ideas. Able to exert tremendous control over himself and others, the psion is a master of mental energy and a creature who studies a much differnet type of science than the members of other professoins. By drawing upon his internal energies, the psion frees himself from a dependence on the mystical flow of magic or the vagaries of fickle gods on high. But this power has its limits as well and experienced psions learn to control the way in which they expend their energy to better deal with the challenges they face. Unlike the arcane or divine spellcaster, the psion depends only on himself and the psionic energy produced within his mind. This gives him a great deal of flexibility, allowing him to call upon any power he knows and can fuel. Unlike even the flexible sorcerer, the psion is not limited to a specific number or type of powers he can use each day - it is all in how he manages the resource of his mind and the choices he makes at the spur of the moment. Within the pages of this book, you will find new ways to expand and enhance the power of psionics, providing the psion with new options and augmentations for his existing abilities.